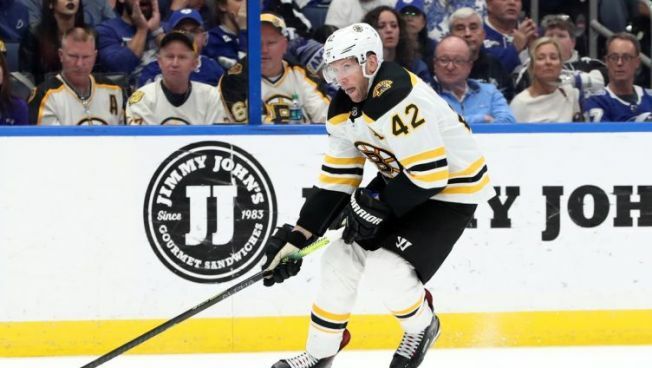 We still don't know the official Boston Bruins lineup for Game 1 of their first-round Stanley Cup playoff series against the Toronto Maple Leafs on Thursday night, but at this point, it would be pretty surprising to see David Backes among the forwards selected. Taking a veteran player out a playoff lineup as a healthy scratch always is difficult, especially for someone like Backes. The 34-year-old winger is a tremendous leader, plays the type of physical hockey B's fans love, and has 67 games of postseason experience on his résumé. Still, making him a healthy scratch absolutely is the right decision by Bruins head coach Bruce Cassidy (assuming that's what ultimately happens). Cassidy said Wednesday he doesn't think there will be any surprises when the lineup is announced Thursday. Here are the forward lines from Wednesday's practice. You'll notice Backes was the extra right wing on the fourth line. This Bruins-Leafs series should feature plenty of hitting, but there's going to be a ton of speed on the ice, too. This series also features two of the highest-scoring offenses in the NHL. Toronto scored the fourth-most goals during the regular season, while Boston ranked 11th. Special teams is going to be pivotal as well, particularly when Boston's third-ranked power play is on the ice against Toronto's 18th-ranked penalty kill. Backes doesn't bring a ton of speed, and his offensive production (seven goals in 70 games) was disappointing this season. He's neither a key member of the penalty kill nor an essential part of the power play's success. Backes' skill set just isn't a great fit for how this Bruins-Leafs series likely will be played. This doesn't mean he won't factor at all in the playoffs. If the Bruins advance, a different opponent could present certain situations where Backes could be effective. Injuries always are a burden in the postseason, and those setbacks could open up opportunities for players who are sitting as a healthy scratch. But at the moment, the best possible lineup for the Bruins entering Game 1 doesn't include Backes. Luckily for the B's, you know Backes is going to handle it like a true professional and do whatever he can to help his teammates.